Here’s my first stab, arranged into some rather arbitrary categories just to give it some structure. Anyone who knows me and fancies a holiday next year – let me know if any of these appeal! Everyone I met in Central America raved about this as one of their highlights – fantastic colonial cities, volcanoes, great beaches, friendly people. This is likely to be my first trip – this November for a couple of weeks. My time in the Andes was probably the highlight of my year. Now I want to see the Himalayas. Probably a bit of a longer term objective this one, given the current state of the country, but I really want to go and visit the country of my father’s birth, I’ve heard some incredible things. Africa is the one inhabited continent I haven’t been to – and I’m very keen to rectify that. These three, one from the north, one from the west, one from the south all appeal for different reasons. Great beaches, lovely mountains, and one of the biggest canyons in the world. One of the nicest people I met on my trip was an Ecuadorian girl, and she got *very* cross that I’d managed to spend four months in Andean countries and not made it there. Fantastic ruins and the oldest continuously inhabited city in the world. People I know who’ve been rave about it. Possibly another long term objective this one – partly because I need to learn to drive before I can tackle the Pamir Highway. I’ve been fascinated by this place since I saw pictures of the Dragon’s Blood Tree that grows on the island. The more I read about it the more obsessed with visiting I become. I have a feeling the place will change a lot in the next decade. I’m keen to see it sooner rather than later. My favourite travel book of all time made me fall in love with Crete from afar. Read it, you will too. Partly because of the volcanoes, but more because of fellow travellers Rob & Vicky raving about their time there to me one night in Guatemala. I’m dying to go back to the Philippines and this is one that really appeals (although well away from the dangerous bit). Again to a travel book, this is the Pacific country I’d like to see most. Portuguese heritage, fantastic music, great beaches, nice hiking. Italy & I haven’t really agreed with each other so far. Time to give it another go, and the food, ruins, cities and volcano hear all sound great. Best diving in the world, or so I keep hearing. 1. GR20 – Along the mountain spine of Corsica, allegedly the toughest in Europe. I quite fancy this in the summer of 2011. 2. GR10/11 – Two paths running the length of the Pyrenees, one on the French and one on the spanish. 4. Tiger Leaping Gorge, China – not least because of the name. 4. Outback Australia – I’ve seen all the big cities. Now I’d love to spend more time exploring the vast empty bits of the country, so many amazing things to see, and even the emptiness itself is intriguing. That list could easily be twice as long…but that’s plenty to be getting on with for now. And like I said, if you know me and fancy any of these let me know! Doesn’t time fly? I’ve been back over four months already and I still haven’t got round to doing the final round-up posts I planned, let alone told you all what I’ve been up to since. Bad blogger. Anyway, here’s the first of those posts, a quick round-up of my year away in the form of some nice geeky numbers. I was away for 364 nights, and in that time I visited 19 countries on 4 continents. I spent 310 nights in the tropics and 54 nights outside them. I was north of the equator for 206 nights, and south for 158, I was east of the Greenwich meridian for 199 nights and west for 165. I crossed the tropic of cancer 4 times, the tropic of capricorn twice, the equator once and the international date line once. I visited 15 capital cities (including both of Bolivia’s) – incidentally the 5 I missed were Guatemala City, Washington DC, Buenos Aires Canberra and Wellington. I slept in 116 beds, and spent 134 nights in dorms, 77 in single rooms, 76 in double rooms, 17 in triple rooms and 13 in apartment. I slept 6 nights in hammocks, 17 on buses, 2 on planes, 4 on a boat, 16 in tents, and 1 in a buddhist monastery. I took 176 buses (including collectivos, minivans, chicken buses, jeepneys and so on), 136 taxis, 25 flights, 51 boats, 21 cars, 21 tuk-tuks (and similar), 2 cable cars, 5 jeeps, 6 funiculars, 10 trams, 2 trains, 30 metros and 2 horse & carts. I visited 34 world heritage sites, 17 pyramids and other pre-hispanic ruins, 44 temples, 34 churches & cathedrals, 5 wineries and 29 museums. I also watched 5 wrestling matches. I climbed 13 volcanoes and visited 21 national parks, 3 deserts, 4 canyons, 9 hot springs, 41 islands, 44 beaches, saw 1 geyser and 5 salt flats and went caving once. 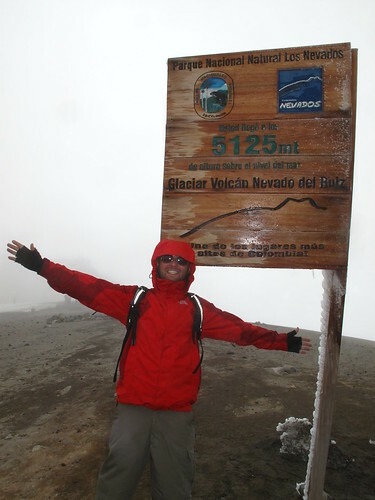 I spent 45 days over 3,000 metres altitude, of which 24 were over 4,000 metres, and 3 over 5,000m (and the biggest regret of my trip is that I didn’t take the opportunity to hike to 6,000m in Bolivia while I was well acclimatised and had the chance). I did 25 dives, went kayaking twice, tubing once, went running twice (and both in the first month, after which I got lazy) and hired bikes 6 times. I did laundry 42 time, sent 24 postcards, made 37 phone calls and took cash out 106 times. I walked through one window, visited 3 hospitals, had 38 stitches, and have 5 impressive scars. I learnt at least a few words in 17 languages (Spanish, Quiche Maya, Quechua, Aymara, Rapanui, Maori, Bahasa Indonesia, Balinese, Bahasa Sasak, Bahasa Ende, Tetum, Portuguese, Filipino, Malaysian, Thai, Burmese, and Khmer). I have now forgotten virtually all of the above except for the Spanish. I met and had conversations with people from 60 countries, including 192 people from the UK, 109 American (who says they don’t travel? ), 79 Australians, 53 Germans, 41 Canadians, 34 French, 33 Swedes (almost all in Indonesia), 30 Filipinos, 27 Israelis (all in Latin America), 27 Dutch, 26 Dutch, 26 Swiss, 25 Irish, 23 Mexicans, 15 Guatemaltecos, 14 Chileans, 14 Danes, 13 Spanish, 13 Indonesians, 12 Argentinians, 11 Kiwis, 11 Burmese, 9 Belgians, 6 Brazilians, 6 Peruvians, 5 Austrians, 5 Finns, 5 East Timorese, 4 Italians, 4 Czechs, 3 Bolivian, 3 Malaysians, 3 Hong Kongers, 3 Chinese, 3 Singaporean, 3 Cambodian, 2 South African, 2 Norwegian, 2 Ecuadorian, 2 Thai, 2 Venezuelan, 2 Colombian, 2 Uruguayan, 2 Poles, 2 Portuguese, 2 South Korean, and 1 each from the Isle of Man, Guernsey, French Guiana, Romania, Ukraine, Saudi Arabia, Turkey, Jordan, Hungary, Russia, Slovenia, Congo-Brazzaville, Cameroon, Japan & Estonia. And finally….this blog has had over 115,000 hits, and 1,265 comments and my photos have been viewed just over 120,000 times. Thanks for reading! After nearly a year of travelling, I’d managed to visit some of the world’s most spectacular historic sights – Teotihuacan in Mexico, Copan in Honduras, the Lost City in Colombia, Machu Picchu in Peru, the Moai of Easter Island, Borobodur & Prambanan in Indonesia, and finally Bagan in Burma. But after all that there was still one major sight left to see. 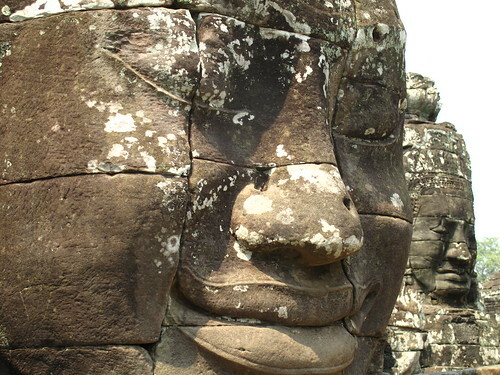 I’d deliberately planned my final couple of weeks to save the best to last – and so my final new country before heading home was to be Cambodia, and for one main reason: Angkor Wat. 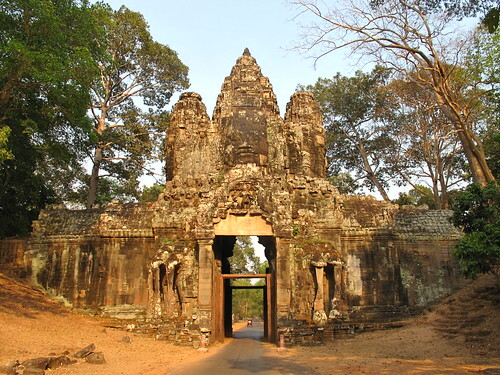 The prospect of visiting Angkor is if anything even more daunting than Bagan in Burma – while Bagan has around 4,000 temples to Angkor’s 1,000, in Angkor they are spread out over 1,000 square kilometres (making Bagan’s 50 seem relatively compact). Factor in the two million plus annual visitors and trying to work out where to start to see the best bits and avoid the crowds was pretty daunting. So I basically took the easy way out and let someone else decide for me. I hired a moped driver, met up with him bright and early, and soon found myself whizzing out of Siem Reap across the huge, flat, forested plain that makes up the site. I’d briefed my driver to avoid the highlights of Angkor Wat and Angkor Thom (partly to save the best til last, but also because they’re the closest to Siem Reap, making it easier to visit by bicycle the following day). So we started off at Banteay Srei, at 32km away from Siem Reap the furthest of the main temples. The temple is small but beautiful, particularly with its fine, intricate carving. However there was one thing that got in the way – I was instantly disappointed by the crowds. I knew it would be busy, but coming just 6 days after leaving Bagan behind, to be confronted with quite that many people all in one place was a real shock to the system. 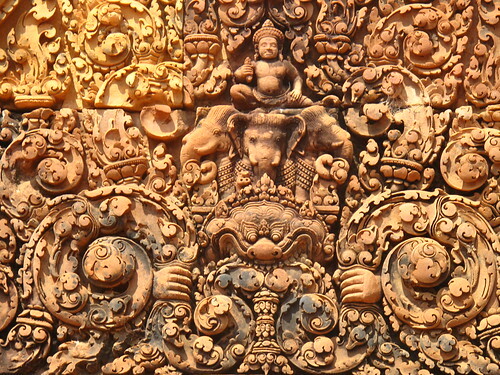 I was worried that the rest of the day would follow a similar pattern, but was very pleasantly surprised – it seems that everyone starts out at Banteay Srei, but then heads off in different directions after that, meaning most places never felt too crowded. 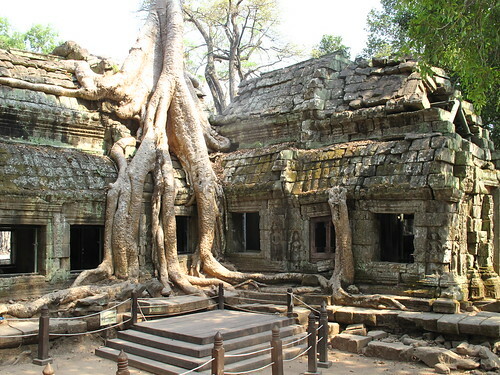 Everyone has seen pictures of Ta Phrom (or at least seen it on film in Tomb Raider). It’s famous for the fact that it’s one of the few that hasn’t been completely restored, meaning that in several places trees are still growing out of the stonework. Despite having seen it in a million photos, it’s even cooler up close. Having said that though, it’s one of the busier temples, which is why I much preferred Ta Som. 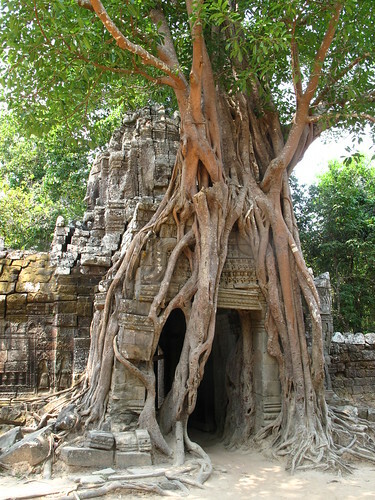 Ta Som is a tiny little temple – but its eastern Gate has been entirely devoured by a tree, possibly even more impressively than at Ta Phrom. And with way fewer visitors. Near to Ta Phrom is the massive Ta Keo – which is certainly worth skipping if you have a fear of heights, for the staircases are ridiculously steep. It’s all worth it though, for the views from the top are spectacular. Meanwhile Preah Khan was the final highlight of my first day, its enormous ruins are like a massive crumbling maze I wandered around getting lost for ages. After a long day on the motorbike I arrived back in Siem Reap amazed at the wonders I’d seen and even more excited about the following day. And that of course, was when it started to go wrong. 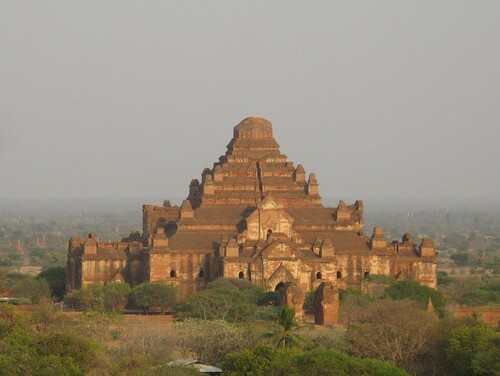 I really should have learnt from my mistakes in Bagan, and spent day two with a driver. But oh no, with nice paved roads meaning no danger of punctures, I headed out bright and early on my bicycle for another day of exploring. Yet again of course, this would turn out to be a mistake. First of all, I’d underestimated the distances involved (funnily enough the kilometres fly by when you’re on a moped…but no so quick under your own steam). The area is flat enough, but I’d completely failed to factor in the fact I’d be cycling long distances in a steamy, humid, tropical climate. I was soon soaked to the skin in sweat, and getting through water at a ridiculous rate of knots. Being on my own, without a local moped driver, also exposed to me to another danger I’d entirely missed the day before – the millions of hawkers who patrol every single temple. As soon as I’d stopped my bike and started to lock up, I’d find myself surrounded by kids trying to sell me drinks, postcards and nick-nacks. Alongside them would be yet another group intent on dragging me off in different directions to get me to eat at their restaurant. With me being on my own, and a bit hot and bothered, there was no escape, no laughing it off with a mate, and instead it soon became deeply annoying. Further disappointments were in store – I pulled up outside the star attraction, Angkor Wat….only to find the main face covered in scaffolding for a refurb. Marvellous. It was also, of course, the most crowded I’d seen so far. The day wasn’t all bad – the temple of Bayon, crowned with dozens of faces carved into its towers, was probably my favourite of all – but overall, the combination of heat, hawkers, and crowds meant my patience was beginning to wear thin. 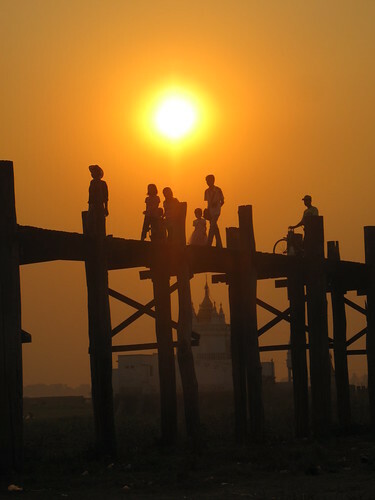 The final straw was seeing sunset from Phnom Bakheng. 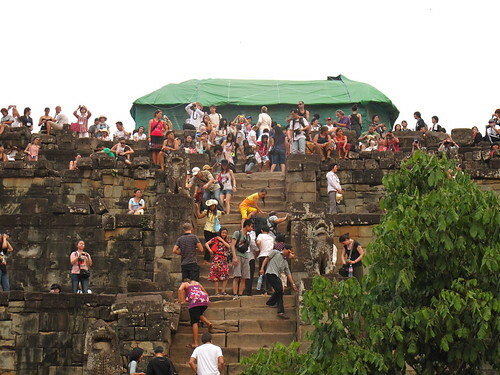 I’d been warned that the premier sunset viewing spot would be crowded – but nothing could have quite compared me for the entire tourist population of Siem Reap converging simultaneously at the top of a temple. There was barely room to move, and to cap it all, the sunset really wasn’t all that spectacular (especially as the position of this temple doesn’t let you see temples framed against the setting sun). In the end I headed back down before the sun had even slipped below the horizon, to get away from the crowds, and I began to reflect that the real problem was that I was simply templed out. A year of sightseeing had been amazing, but I realised that I was starting to get blase about it. The more spectacular historic sights, beautiful sunsets and amazing landscapes you see, the more everyday they become and the fussier you get. After months of thinking I’d never be ready to go home, the slight feeling of disappointment I got on my second day at Angkor finally made me realise it was time to go home. Strangely enough, knowing there was no more sightseeing to be done almost felt like a weight off my shoulders. All that was left now was a week on the beach topping up my tan, a weekend of partying in Bangkok, and then home. It’s funny think that if I hadn’t walked through a glass door and ended up in hospital I might never have made it to Burma. 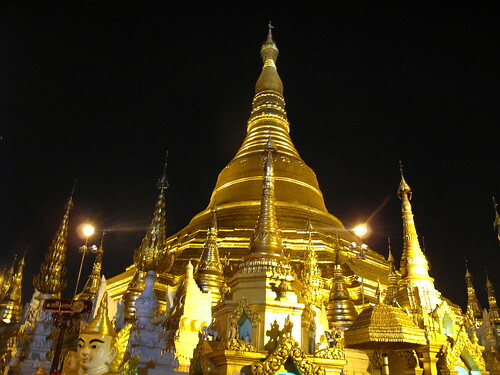 But doing just that put paid to my plans to spend some time diving on the Andaman Coast, and finally made my mind up to book a flight to Yangon. It’s probably worth saying straight off that for a long time I had been a supporter of the tourism boycott (that interestingly seems to have a far higher profile in the UK than in many other countries), but in the last year I’ve had numerous conversations with other travellers that had started me questioning my stance – and finally this year a friend of mine from back home who knows far more about Burma than anyone else I know talked me into it. Ultimately the thing that swayed me was the argument that the boycott is damaging the people far more than it is the government (who don’t suffer that much at all thanks to being propped up with cash from lots of Asian governments like China). Sanctions mean that Burma gets way less development aid (about a quarter of the amount per capita) than near neighbours such as Bangladesh, Laos & Cambodia. Visiting as an independent tourist offers a way to give money directly to people running private businesses (incidentally the Lonely Planet is pretty helpful at advising you on how to minimise the amount of cash you spend that goes to the government), and we made a real effort to spread our cash around rather than spend it all in the same place. Furthermore, it was interesting to see quite how much people were willing to open up when talking one to one, about their views of the government – and it seems that the vast majority want tourists to come and see for themselves how the junta keeps the people poor and repressed. There were times too when the poverty became hard to bear – between the five of us, we tried to spread our money round as much as possible to help as many people as possible – but you have to acknowledge you can’t help everyone – which led to a sadly farcical situation in Inwa, where we decided we’d rather sight-see on foot, and spent the afternoon being followed around by a horse and cart driver desperately trying to persuade us to use his services (and being told repeatedly no). We ended up trying to escape him by taking short cuts across fields, but every time we thought we’d got away he’d turn up again. Luckily though the highs easily outweighed the lows. I’ve already written about how Yangon is one of my favourite cities in Asia, on how Bagan really deserves to rival Angkor Wat in terms of global fame, and on the wonders of trekking from Kalaw to Inle Lake. But there were plenty of other highlights too. 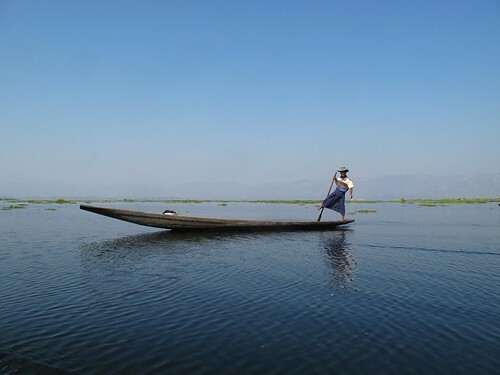 Inle Lake itself is absolutely stunning. It’s edges dissolve into a series of floating vegetable gardens and houses on stilts, so it’s hard to see where land ends and lake begins. Even better is taking a boat out early in the morning to explore the area – at that time of day on a clear day even the sky and the lake seem to blur into one. Meanwhile around Mandalay it’s easy to spend a day stopping off at the former capitals of Inwa (with its rather amazing leaning tower), Sagaing (and its many temples on a hill overlooking the mighty River Irrawaddy) & Amarapura (with the rather incredible U Bein’s Bridge, at 1.2km long, the longest teak bridge in the world). 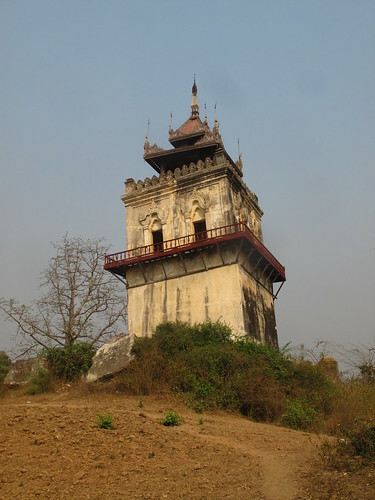 In terms of natural beauty and historic interest, the places I visited in Burma rival anything else I saw in Asia, and all with way fewer tourists than in most neighbouring countries (and all still pretty cheap too). Even better is the fact that in many ways its traditional culture is better preserved than many countries in the region. For a start, it’s the only Asian country I’ve been to where people still stick to traditional dress, with the clear majority of men & women preferring the skirt-like longyi over trousers. Equally distinctive is the use of thanaka, a creamy paste derived from a sandalwood-like tree, and which most women and children use on their faces and arms as a natural sunblock. Best of all though, yet again were the people. From the moment we arrived at Yangon airport to the moment we left, we were overwhelmed by the friendliness of the people we met everywhere. Everyone says mingala ba (hello) in the street, people regularly stop just to have a chat, and people go out of their way to be helpful, and even when times got a little bit stressful people were always there to help cheer us up. 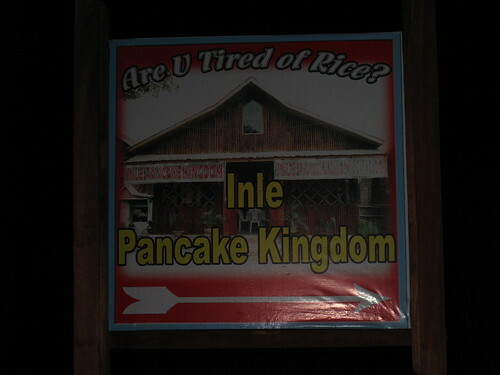 People constantly surprised us with their reactions, like the woman from Inle Pancake kingdom who chased us down the road to try to return the money we’d left as a tip (she thought we’d accidentally overpaid). It’s a great tribute to the people that they manage to remain so friendly and upbeat despite the best efforts of the government, and I hope one day soon that they get to escape from military rule. You can see all of my photos of Buma here. With over 4,400 temples in a space the size of Manhattan, the biggest problem you face is deciding where to start. Especially when you’re still recovering from a dreadful bus journey. 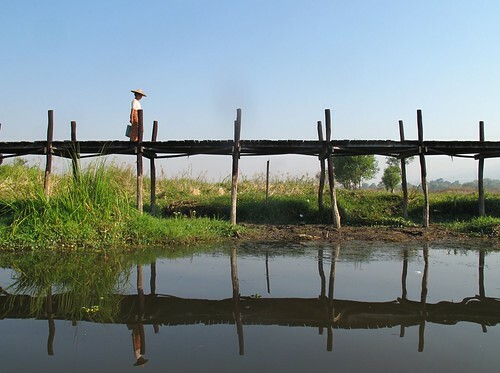 Our bus from Inle Lake was ‘only’ supposed to take 12 hours, but it started to go wrong from the start. Our taxi dropped us off at the road junction at 4am, only for us to sit there shivering for an hour by the side of the road while we waited for the bus to turn up. If it wasn’t for the nearby hot donut stand I think I may have cried. Eventually, though, it turned up, and we began the long, slow winding journey down through the mountains. Progress was glacially slow, as we seemed to stop EVERYWHERE to pick people up – and this on a bus so small that each seat only sat one and a half people, meaning we had to take in turns to be the one with one bum cheek balancing on the seat and the other hanging off into the aisle. Although at least this was balanced out by the ability to stretch one leg out – for the leg room was minute, and not helped by the fact that the area under the seats was stuffed with luggage. As if that wasn’t bad enough, we then ended up stranded in Kalaw for about three hours with a damaged axle. It all got a bit much for Sam who decided to run down the road to try to by a plane ticket to Bagan instead. I was on the verge of cracking as well, when eventually they fixed it and we were back on our way. And in the end we were only 5 hours late – that’s 17 hours stuck on a bus, and without doubt the worst journey in over 11 months of travelling. 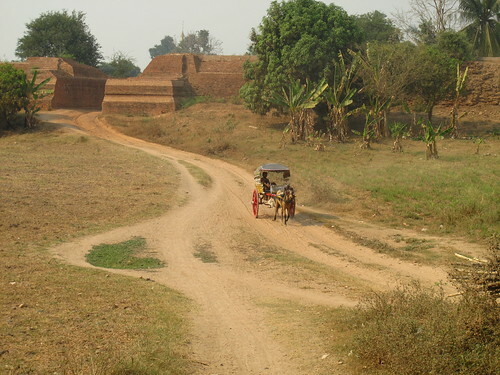 With such a nightmare behind us, it was an easy decision to spend the next day on a tour rather than under our own steam, so we hired a couple of horse & carts, and spent the day being driven around the major temples. 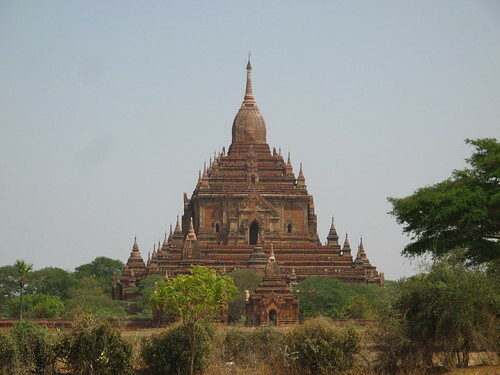 As we drove down the main road from Nyaung U towards Old Bagan, it soon began to become apparent quite how many temples there are in the area – they are literally everywhere. The site is on a wide, flat plan in the bend of a river. 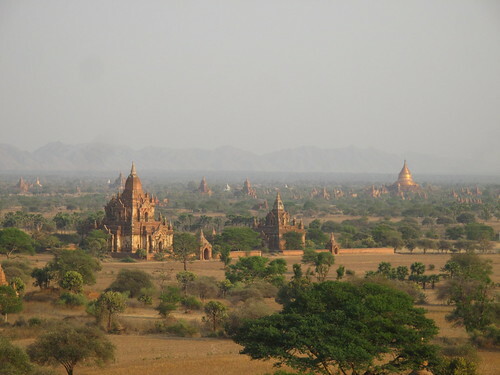 It’s a very dry region, so it has an almost desert like feel, with smaller bushes and trees rather than being thickly forested – and one of the benefits of this is that its easy to appreciate quite how big the site is and quite how many temples there are stretching away as far as the eye can see in every direction. They were built over a period of hundreds of years, with each successive ruler wanting to leave his mark in a different way, meaning that the temples are in a variety of styles, shapes, and sizes, from tiny to gobsmackingly large. Some of the them have fantastic beautifully painted interiors. Others have huge stone buddhas in varying positions. Many have massively thick walls and are dark and mysterious inside. Others allow streams of natural light pouring in from different doorways. Here and there you come across ones that are still being repaired after a devastating earthquake in 1975. 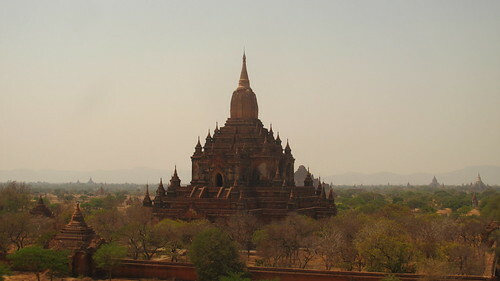 Best of all are the ones that allow you up onto the roof, from where you can really appreciate the scale of Bagan. Our cart driver clearly knew what he was doing though – for he saved the best til last. Just before taking us home, he took us to a small temple just outside the city walls. From there we climbed to the roof – and were rewarded with the best view we’d had to date, with all the biggest temples lined up around us. I’ve been lucky enough to see some of the biggest and best ruins in the world in the past – Teotihuacan, Machu Picchu, Borobodur, Tikal, Ephesus – and none of them even come close to matching the scale of Bagan. Utterly breathtaking. Feeling refreshed after an easy day being driven around, and a good night’s sleep, we decided that for the next day we’d take a more strenuous option, and hire some bikes to get a bit more off the beaten track. This turned out to be the worst decision of the trip so far (yes, even worse than eating in bus station in Yangon). For getting off the beaten track meant getting off the roads, to see the temples of the central plain. It started to go wrong almost immediately as we soon found ourselves cycling into thick sand that made peddling impossible, so our progress was slowed as we kept having to stop, then push the bikes for a bit, then get back on, and then off again…. As if that wasn’t bad enough, things soon started to get worse. One by one, we all succumbed to punctures. First one wheel, then the other, until all five of us had two flat tires. The culprit? The whole area was growing with thorny bushes, leaving vicious, 2cm long thorns everywhere. The combination of flat tyres and thick sand made riding impossible, so we were forced to push on, getting more and more dehydrated. Things soon got even worse, when am cycled over a branch and had some thorns whipped across his leg – producing quite a lot of blood. Consulting the map we realised we were still quite some distance from roads in every direction, and with steadily dipping morale we pressed on, abandoning plans to see certain temples in favour of the most direct route back. Just as we were about to collapse, we turned a corner…and found the first people we’d come across all day, at a remote temple in the middle of nowhere. We were delighted to find they had a little shack selling cold drinks. And even more so to find they could actually repair our punctures – it turned out that each bike had dozens, and in the end it took five of them a good hour to fix, while we cooled off. Refreshed and revived, with working bikes again, we were delighted to find from there on in, that the dirt road was wide, smooth, and clear of thorns – and the rest of the day passed by like a dream, stopping every hundred metres or so for yet another stunning temple. There really is nowhere quite like it in the world. 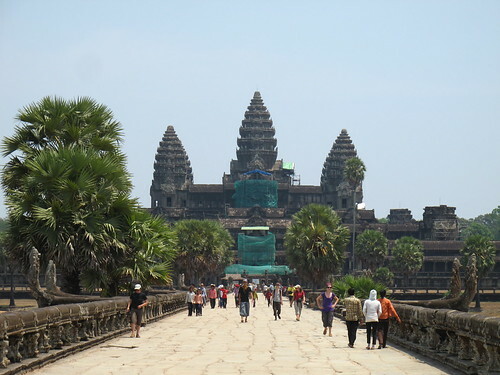 Two days was enough however – as after that we were truly templed out, and I was beginning to worry whether or not visiting Angkor at in a week’s time would really be a good idea…. 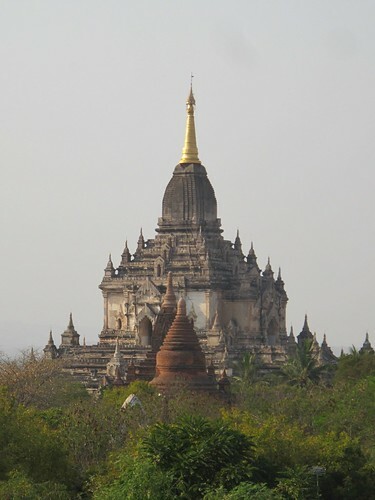 You can see all my photos of Bagan here.